Item arrived and is beautiful. I only wished there were assessories such as a bedside table cover and others to go with it. Turn on the charm with this elegant, yet casual, floral toile with shirting stripe accents. Updated in a modern neutral palette of pearl gray and white with charcoal accents, this classic pairing will transform your bedroom into a relaxing country house retreat. The slightly distressed texture over-printing the floral pattern as well as the textural effect in the shirting stripe reverse add depth and visual richness to this simple design. Embroidery, quilting, and ruffle detailing on the European shams and decorative pillows reflect the designer’s signature style. Soft, all cotton fabrics offer ease and comfort. Layer with our Laura Ashley sheet sets and accessories, sold separately. Bedding set is 100-percent cotton, and machine washable. This bedding set is the perfect addition to your room, classic French country design including all of the elements you need to set up your new bed. Very pretty set. Good quality, overall I am very happy with this purchase. Washed well. Didn’t bunch up or fade like most comforters. Works well on our spare bed. Very nice!! The accent pillows are super cute. The color is true to the picture. 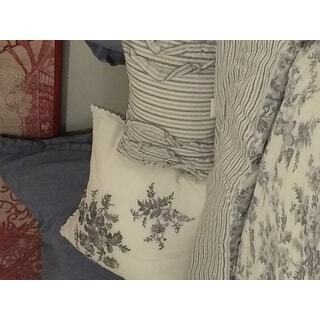 The pillows shams are very pretty and feminine. The shams are for European pillow which I love! This is a beautiful set, but as is nearly always the case, you really need to size up if you have a queen size bed if you want it to look the way it does in the picture. I originally purchased the queen size, but returned it for the king. It fits much better. The set is also cotton, and I have to wash my bedding somewhat frequently. I'm afraid it would shrink in the wash. Unfortunately, I now have king size pillow shams, which are too large for my pillows. Not sure what I'm going to do about that yet. My photos are of the king size comforter on my queen size bed. I just got this comforter yesterday. I was looking for something that was plush but not polyester. It was important that it looked full and wasn't shiny or cheap looking. Pardon the dog bed/toy in the photo and the fact that the bed wasn't straightened up! The pillows and shams really make this look richer, and I feel like it looks so nice. 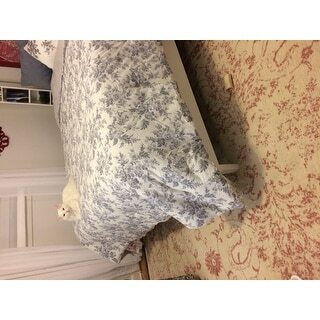 I grew up with Laura Ashley bedding, so I knew I could trust this brand over an alternative from china that arrived (from another site) looking so cheap. I paired this with some grey polkadot sheets from another retailer and just need to get some different curtains to make the set complete. True to color in photo! Quality matches the price. 2 large grey European shams are included, so I will need to purchase European pillow forms. I Purchased this set for a full sized/double bed and it gives more coverage on the sides of the bed than does a regular double/full size comforter. Not disappointed with this purchase. What a relief!! Beautiful set! 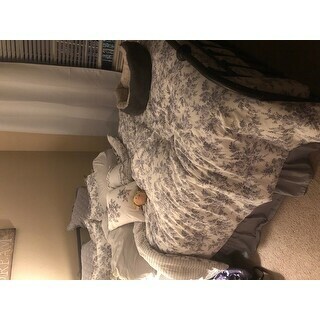 The fabric is very soft and both sides of the comforter is really pretty. 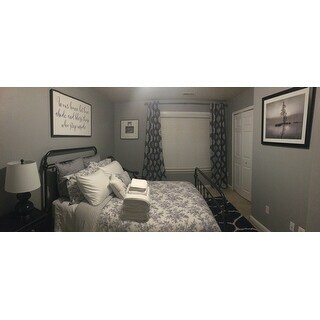 I had to buy "European size" pillows for the solid shams in this set, but it all looks great! Great quality! Even more beautiful in person. I'm in Love with this set! And it's reversible! Very thick and perfect for farmhouse style! The throw pillows are absolutely adorable! 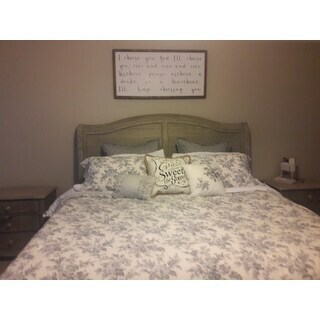 The grey shams are quilted and are perfect. Love this set! I have had this set for about six months and I could not be happier with the quality. My only criticism is that the two Euro shams are too small for my King size bed. I purchased two white ones (from the same manufacturer) and my bed is complete! I love this! It is light and pattern is muted. Love the accent pillows. It fits well with a French Provincial look or French Country. Purchased the valences to match. Thanks Overstock! Love this set! It’s so soft, even without washing. Love that there are two different styles of shams - the colors and styles compliment each other nicely. Beautiful set! Well made and lots of extra's included. Granddaughter loves her new bed set. very pretty light for spring and summer. I have looked everywhere for this bedding. It is so cute! We are putting our house up for sale, the Realtor loves this look. Thanks Overstock. I ord er ed king size instead of queen size and it was perfect! Love this set! Beautiful in person! "On the King set, will I need to buy King sized pillows for the shams?" "Does it have a dust ruffle and what is the width of the curtains?" Set includes: 1 comforter, 2 shams (1 sham in Twin set), 2 Euro shams (1 Euro sham in Twin set), and 2 throw pillows. I hope it helps. "Are there any blue tones to the gray shades. Is it truly grey?" 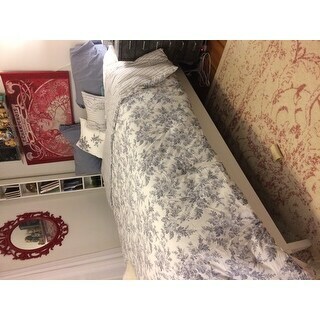 Love toile bedding and have not been able to find anywhere. Thank you for ending a very long search. The floral grey was exactly what I was looking for. I liked the design and the price.